Here's how you can prepare for class. Thanks for respecting our guidelines. Read the class descriptions to determine an appropriate level class. Previous Iyengar Yoga experience is required in Level 1-2, 2, 2-3, and 3 classes. Contact us if you're uncertain about what level is best for you. 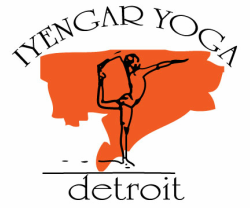 Iyengar method offers individualized instruction. Teachers may offer specific instructions or corrections to students and provide manual adjustments to help student receive maximum benefit of the pose. 5-week Intro students, are welcome at any Level 1 or Community Gift class. Intro sessions expire after 5 weeks. Monthly class passes are non-transferable. Feel free to pay by cash, check, or credit card. Credit card payments may be made ahead of time or before or after class. Dress modestly in fitted shorts or tights and t-shirt. Yoga is practiced barefoot, with an empty stomach. Turn cell phones off. Leave shoes near the front door and extra clothes in cubbies by reception area . Valuables, water bottles, towels, etc. can be brought in and left at the sides of the studio, not in the studio.. Please do not drink water during class, but afterwards. No perfumes or other strong scented products please.